The historic theme of Durango, and specifically Rio Grande Land, has been and will always be the narrow gauge train, now a federally designated National Historic Landmark (the D&SNGRR). The coming of the Denver & Rio Grande Railroad Co. in 1881 provided a means by which to haul freight, passengers, silver and gold ore to and from the San Juan Mountains. Spearheading this railroad project was a developer by the name of General William J. Palmer, who also initiated the development of a smelting facility, a limestone quarry and several coal mines near Durango. Thus the rapid "boom" of Durango in the 1880s began, the train depot in Rio Grande Land serving as the central hub. At the time, many of Rio Grande Land's early buildings were simple wood frame structures, but in 1889 a disastrous fire broke out that leveled most of the downtown area. As a result, new buildings were constructed of stone and brick, one reason the downtown area has endured so well over the years. Further, the town has made a concerted effort to retain its historic flavor. Establishing Main Avenue on the National Register of Historic Places in 1980 has resulted in the preservation and renovation of many fine old structures in the downtown area. Even before achieving that distinction, however, private developers made attempts to recognize the historical sanctity of Durango. Mr. James Jackson of Jackson & Jackson was one of those developers, a true visionary responsible for the extensive and successful renovation of Rio Grande Land in the late 1970s [Frederic B Wildfang, Images of America: Durango]. He was instrumental in raising Durango's image from a little Western cow town to a major historical tourist destination. "The nucleus of such a grand scheme was always there, all anyone had to do was enlarge it." Please contact Jackson & Jackson for information about leasing opportunities in Rio Grande Land at (970) 259-0531. 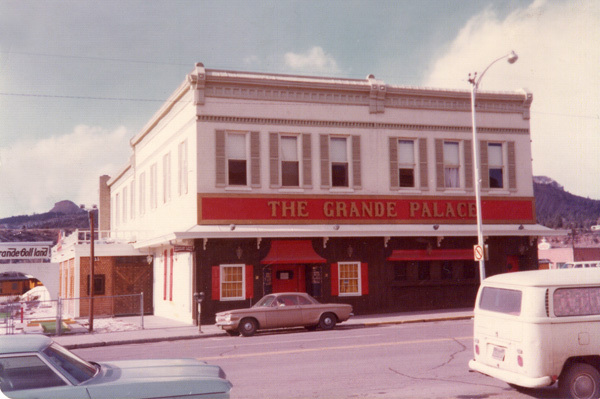 Circa 1972, The Annex to the Grande Palace - previously the Palace Hotel (see below). This building is now home to the Rio Grande Trading Company and Sizzling Siam Thai Restaurant. 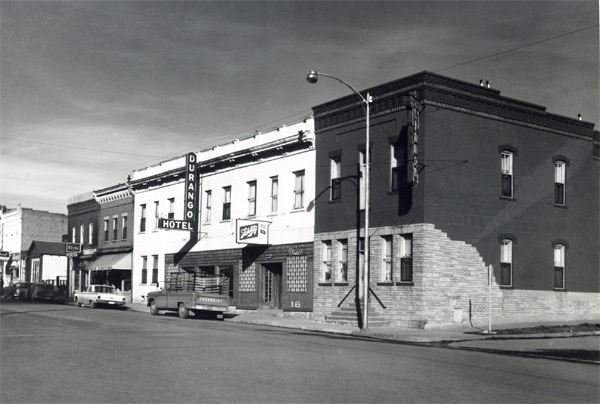 The Durango Hotel (white building) and the adjacent building on the corner are no longer in existence. That area is now a paid parking lot across from the train station.